A centrifugal method for determining the coalescence stability of emulsions by analytical ultracentrifugation under separation of dispersed phase is described. The non-kinetically oriented method involves demulsification up to constant heights (final values) of all the layers. It can be performed in various variants including stepwise centrifugation that provides several final values during one run. On this basis, coalescence pressures are calculated as a measure of coalescence stability. The results obtained are in agreement with the expected behavior of the emulsions. In the case of SDS stabilized n-decane-in-water emulsions without electrolyte four layers are obtained that exist only during centrifugation under a sufficient centrifugal force, but not under gravity. A proof is given of a pressure barrier at the transition of the non-transparent to the transparent emulsion. The possible influence of the particle size on the coalescence pressures is discussed. This paper was presented at the “VII. 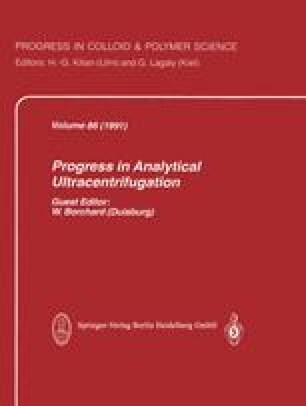 Symposium on Analytical Ultracentrifugation”, Duisburg, FRG, February 28 — March 1, 1991.